There was a fire on this corner last week, so we walked by today, and the buildings are already gone. There are now 3 vacant lots here. The one closest to the remaining building, was 127 Green Street. It was owned by Marvin Smith (Owning the Realty Inc.) and it was demolished maybe 10 years ago. The two remaining buildings were in bad shape and were vacant and supposedly being remodeled when they caught fire. 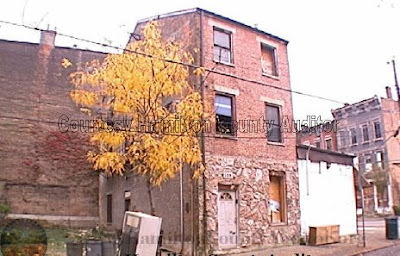 The one on the corner was a one-story store, and the other was a typical OTR 3 story brick residence.